About the Author: Jesper Bondo Medhus is the medical doctor and cycling coach helping cyclists to ride faster with less training. He has compiled a very successful e-book with his best training techniques for time limited athletes. Sports Exercise Engineering will be reviewing this latest edition from the Training4Cyclists Hall of fame over the next couple of days. Other notable books from Jesper include “Time Effective Cycling Training” which can be also purchased for the training4cyclists site below. 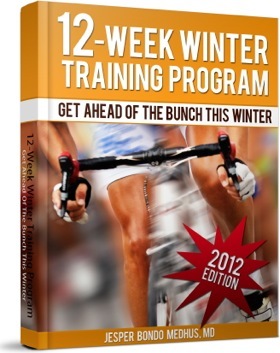 This entry was posted in Reviews and tagged 12 Week Winter Training Program, cycling training, E-Books, Endurance, ergometer training, Indoor Cycling, Max Power, spinning classes, Test Protocol, Threshold, TT, VO2 Max, Watts, winter program. Bookmark the permalink. Jonathan….wonder how this compares to Carmichael’s “Time Crunched Cyclist” ?? Hi Lance, Jesper sent me a copy the other day so I’m having a read (review) at the moment…I’ll have a review up in a couple of day’s….so I’ll be able to compare apples for apples then.